In our Lower Elementary class one of the many ways we teach children to read is using the Biome Readers. 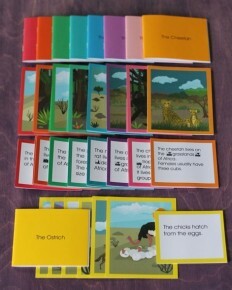 The Biome Readers are a set of color-coded little booklets, pictures and cards with words or sentences on them. This particular set is all about Africa. The color coding follows the Reading Program with each color matching a certain reading level. The program is designed to present the phonetic elements in a systematic and sequential order. Orange – blends grouped with common letters to make beginning blends, ending blends, then both. 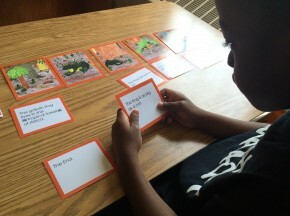 In a previous part of the Reading Program students start out learning to spell the words on a set of cards, then in the next step, students lay out the cards and match the labels. After learning the words they start with the Biome Readers. 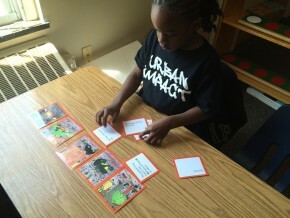 First they use the booklets to focus on decoding the story, next they read the same story again split up on individual cards and match them to the pictures in the correct order. Numbers on the back of the cards allow students to check their work. When a class is learning about the continents the Biome Readers are a great way for children to read about the people and animals that live there. In case you missed it last week, we talked about the grammar solids and symbols and coming up will we be focusing on two language works from our Upper Elementary!